You make their Ranchero Breakfast Tostadas by crisping the corn tortillas in the oven and topping them with black beans that have been mashed with light sour cream and green onions. 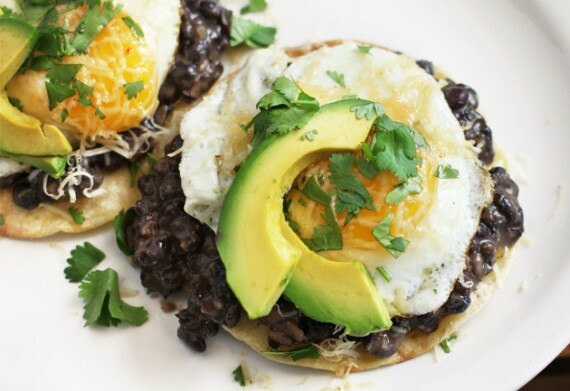 Then you crown each mound of black beans with a sunny fried egg, Cheddar cheese, avocado slices and cilantro. Not a drop of tomato-chili sauce in sight. It’s got the Mexican thing. It’s got the hot-and-cold thing. And just when you think it can’t get any better, you add a squirt of lime and a dash of hot sauce, and it TOTALLY DOES. If fried eggs aren’t your thing, feel free to use scrambled or poached eggs instead. For the Black Bean Mash: Drain the beans, and warm them in a saucepan over low heat. Add about 1/4 cup water, 1/4 cup of the sour cream, green onions, cumin, salt and pepper. Mash the beans with a potato masher or fork until coarsely mashed but not entirely smooth. Stir in the bacon (if using). Season, add the remaining sour cream (if you like), then turn off the heat and keep covered until needed. Brush the tops of the tortillas with a bit of olive oil, and lay them on a rimmed baking sheet (it’s fine if they overlap). Bake until lightly browned, 6 to 8 minutes. Remove from the oven, and set aside. Heat a large frying pan with the butter over medium heat. Working in batches as necessary, gently break the eggs in the pan, and cook sunny-side up or to your desired doneness, covering the pan if you like your yolks more cooked through. To Assemble the Tostadas: Top each tortilla with about 1/4 cup of the bean mash and 1 egg. Then evenly divide the cheese, avocado slices, and cilantro among your tostadas. Serve garnished with a slice of lime and hot sauce to taste.